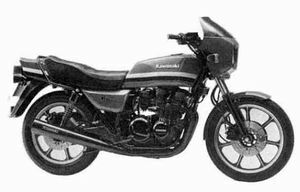 The Kawasaki KZ750R is a motorcycle produced by Kawasaki in 1982. 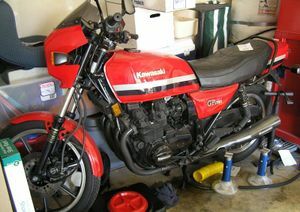 The Kawasaki KZ750R was a 4-stroke inline-four cylinder produced by Kawasaki in 1982. Upgraded from the Z(KZ)750-L. Oil cooler, mini-fairing, black chrome plated mufflers.